HOTEL WAIKIKI: Do You Like Mountain Dew? Do You Like Mountain Dew? I wish it were feasible to do something like that with empty Heineken bottles, given it's the usual (cheap) ones that we pick up at the store. Now that is mighty interesting, I must say! Rowena- how many empty Heineken bottles are you talking about? Hehe. Kay- the genre is dubbed "redneck" for some reason. 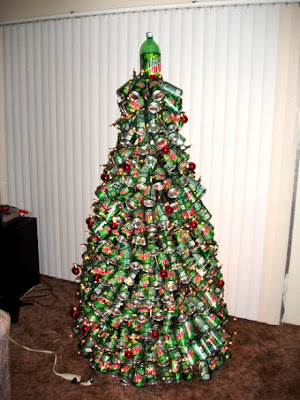 Rowena can probably make a couple 7' trees in the next week with the Heineken bottles! Nate- Rowena's tree is White House material. Just poking fun.